To me the cuckoo clock is a symbol of homeliness and of days gone by. I have always been drawn towards decorative things that seemed impossible to make, they seemed somehow magic or extra special. 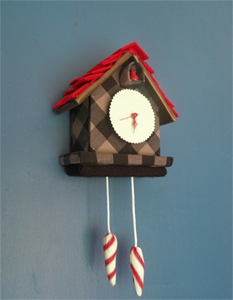 I thought it would be a fun excercise to make a ‘Homemade’ cuckoo clock for the ultimate homemade piece. The clock is made out of balsa wood and cotton fabric. 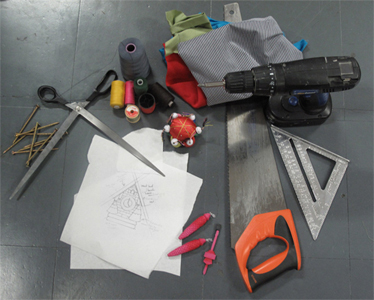 I am an Australian fashion designer and freelance maker of ‘things’ based in Dublin, Ireland. I design and run a mens and womens clothing label called Arms. If you need any clothes, costumes or ‘things’ made, don’t hesitate to contact me.